Upon measuring the Power Output of the UV-3R+Pus on 223.5, I find the power is greatly reduced, On 2M and 440, I see +33dBM, which is 2W. On 223.5, I only get +12.26dBM, which is pretty lame. That come out to be 0.0168267406W, or roughly 16mW. So there must be some Filters messing with us. But I can hear it in my Kenwood TM-331A mobile rig just fine, so for short simplex it will work. Also to some repeaters where U have a good shot at it. The stock antenna is optimized for 2M & 450 so I need to score a Triband antenna so I have a chance of getting out with the 16 Milliwatts. RX sensitivity is pretty good. Measured at -119dBM minimum discernable signal. So it WORKS on 222, KINDA! In a follow-up post is a link to an app that will auto-mod your .ini file to open the frequencies. He has successfully used the program with a UV-3R Mark II and a UV-3R + Plus. Head on over to Mark's (VE3PZR) page and check it out. Some models of the radio are able to support a much broader range of frequencies if you store a special memory file into the radio. If you have an existing memory file, re-run the soft-mod program to change the Band Plan that is embedded inside the .3R memory file. Load the memory file inside UV-X4 and write the memories to your radio and your radio will now have 220mhz added to your radio! Tech TIP #1: If you are unable to write a memory file to your radio, power-on while holding down the VOL button. It will reset your radio back to factory and you will be able to write the extended frequency file. Tech Tip #2: 2 memory files are included. Both files have 220mhz included but during tests with other hams, we found that my radio gave better 220mhz results if we lowered the UHF instead of raising the VHF frequency range. I suggest testing both methods with your radio to verify results. From Chris, 2E0CTH, a video comparing the original UV-3R, the Mark II, and the + Plus model. "Andy, I tried not disable the DW and turn PRI ON. It works. It scan two channels on top and one channel on the bottom line. WOW, now I can monitor three channels at the same time." Geoff (N3OWJ/4X1GM) provides a great summary of the differences between the UV-3R Original/Mark II and the UV-3R + Plus models. I added the links to his original text. "From the specs and advertisements, the Mark II and the Plus are thesame radio. The changes are external. takes one with the pin in the radio. The Mark II uses a 4 conductor earphone plug for the speaker/mic andprograming. The PLUS uses a Kenwood/Woxoun speaker mic connector (2separate plugs). The PLUS shares antennas, earphones, speakermics and progaming cableswith the Wouxoun and if you have both an original or Mark II and aPLUS you will need two different sets of each. The Mark II uses the same battery as some of the Nikon and othercameras (but not any Canon), the PLUS uses a special battery. The Mark II battery has to be taken out of the radio to be charged in the external charger, which is why no one ever does it, they leave itin the radio to charge. The PLUS has charging contacts on the back and it looks like you charge the battery by dropping the radio into the external charger. There are videos on YouTube of a car running over the PLUS and it falling from 5 meters with no damage. I would not expect a Mark II tosurvive. The PLUS is significantly bigger and heavier. 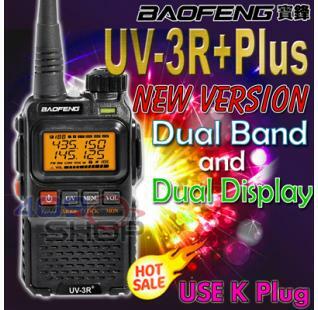 Yaseu AA battery packs for similar radios work on the original and Mark II and there are cheap knock-offs. There are currently no AAbattery packs for the PLUS." A quick video on setting step sizes on your UV-3R. 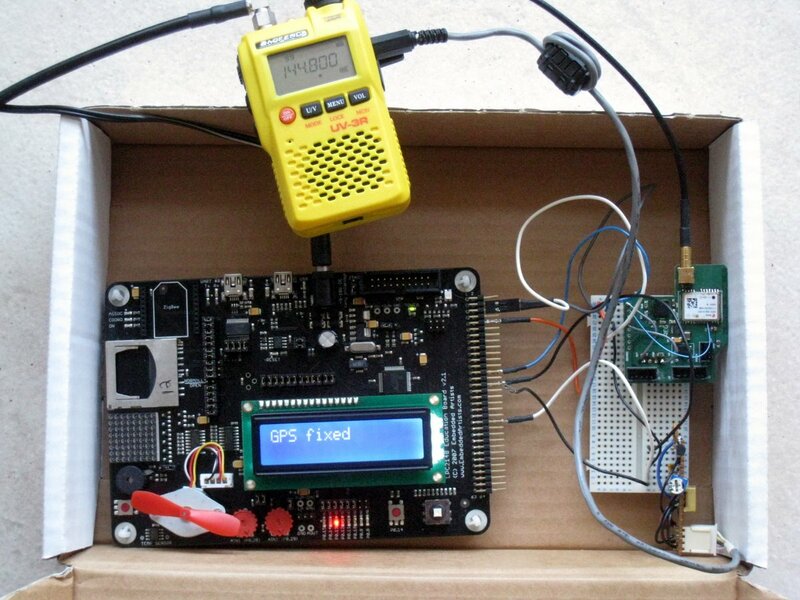 A detailed report of an APRS project using our beloved UV-3R. A new version... the UV-3R + Plus. I wonder if we should call it the "plus plus" or maybe the "plus squared." Andy points out that it has a Kenwood type plug. The buttons look a little different to me, too. 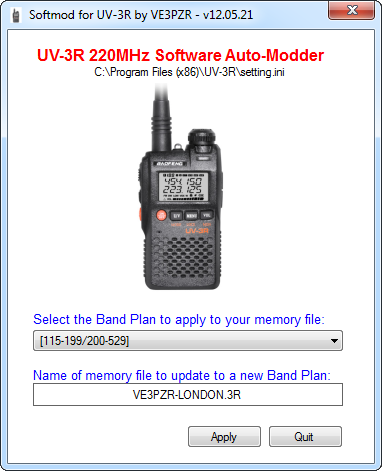 The latest version (1.10) of the UV-3R/UV-X4 software fixes a bug where frequencies are rounded incorrectly.